One need look no further than Hollywood blockbusters like The Martian, Gravity and Interstellar for futuristic visions of life beyond Earth as we venture longer and deeper into outer space. But what about the human body’s response to real-life spaceflight—what are the health effects? Will space travelers age at different rates than those of us on Earth? Just how adaptable to the space environment are we? In November of 2012, NASA selected astronaut Scott Kelly for its first one-year mission. 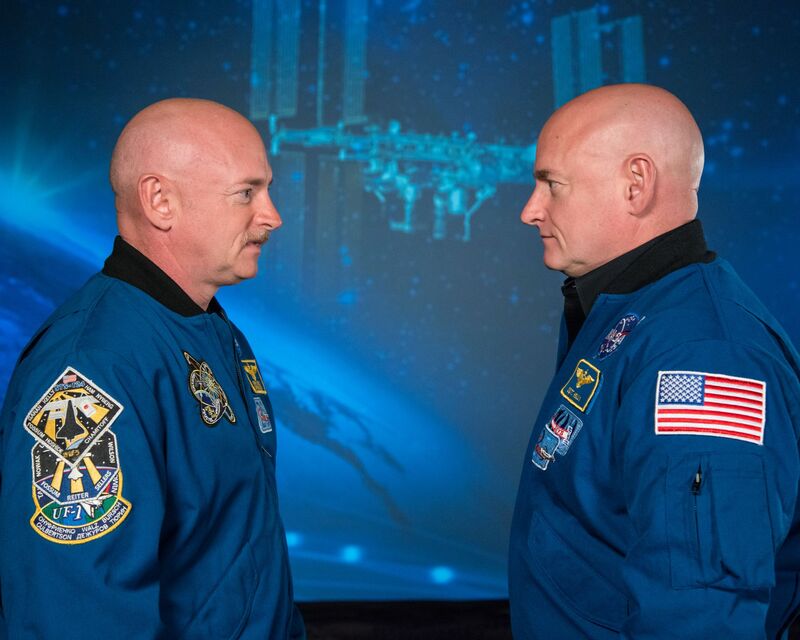 At a press conference not long thereafter, it was Scott who hinted that that this mission might provide the chance to compare the impact of space living on his body with his Earth-dwelling identical twin brother, Mark Kelly, who had also been an astronaut and former Navy test pilot. Remarkably, the Kelly twins were individuals of similar “nature (genetics) and nurture (environment),” and so the perfect space experiment was conceived—featuring “space twin and Earth twin” as the stars. Scott would spend a year in space aboard the International Space Station, while his identical twin brother, Mark, would remain on Earth. NASA put out a call and selected 10 peer-reviewed investigations from around the country for the TWINS Study. Studies included molecular, physiological and behavioral measures, and for the first time ever in astronauts, “omics”-based studies. Some teams evaluated the impact of space on the genome—the entire complement of DNA in a cell (genomics). Other teams examined which genes were turned on and producing a molecule called mRNA (transcriptomics). Some studies focused on how chemical modifications—which do not alter the DNA code—affected the regulation of the genes (epigenomics). Some researchers explored the proteins produced in the cells (proteomics), whereas others scrutinized the products of metabolism (metabolomics). There were also studies examining how the space environment might alter the microbiome—the collection of bacteria, viruses and fungi that live in and on our bodies. One investigation examined the immune response to the flu vaccine. Other teams searched Scott’s biological samples for biomarkers of atherosclerosis and upward fluid shifts in the body due to microgravity, which can affect vision and cause headaches. Cognitive performance was also evaluated using computer-run cognition tests specifically designed for astronauts. More than 300 biological samples—stool, urine and blood—were collected from the twins at multiple times before, during and after the one year mission. The Kelly twins are without a doubt one of the most profiled pairs—on or off our planet. They are also one of the most interviewed. One question often asked is whether Scott will return from space younger than Mark—a situation reminiscent of Interstellar or Einstein’s so-called “Twin Paradox.” However, because the ISS is not traveling anywhere near the speed of light relative to us, time dilation—or the slowing of time due to motion—is very minimal. So any age difference between the brothers would only be a few milliseconds. Even so, the question of spaceflight-associated aging and the accompanying risk of developing age-related diseases like dementia, cardiovascular disease and cancer—during or after a mission—is an important one, and one that we aimed to address directly with our study of telomere length. Telomeres are the ends of chromosomes that protect them from damage and from “fraying”—much like the end of a shoestring. Telomeres are critical for maintaining chromosome and genome stability. However, telomeres naturally shorten as our cells divide, and so also as we age. The rate at which telomeres shorten over time is influenced by many factors, including oxidative stress and inflammation, nutrition, physical activity, psychological stresses and environmental exposures like air pollution, UV rays and ionizing radiation. Thus, telomere length reflects an individual’s genetics, experiences and exposures, and so are informative indicators of general health and aging. Our study proposed that the unique stresses and out-of-this-world exposures the astronauts experience during spaceflight—things like isolation, microgravity, high carbon dioxide levels and galactic cosmic rays—would accelerate telomere shortening and aging. To test this, we evaluated telomere length in blood samples received from both twins before, during and after the one year mission.